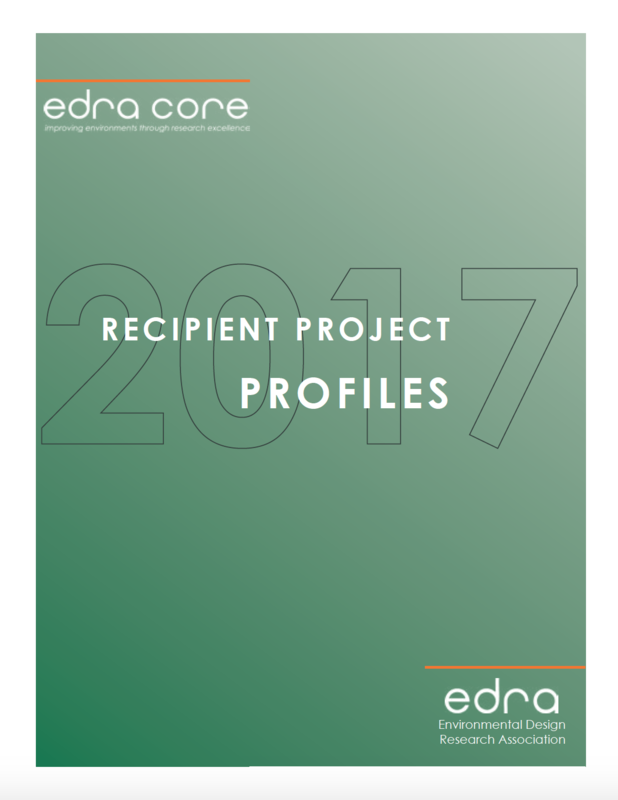 The Environmental Design Research Association (EDRA) is pleased to announce the recipients of the Certificate of Research Excellence (CORE) for 2017. CORE recognizes rigorous, valuable, and impactful practice-based research that sparks innovation and promotes best practice in environmental design. The credibility of academic research is typically judged on the basis of well-established protocols and peer-review processes – but what constitutes research quality in the context of the practice of environmental design? The tools used to assess academic research do not easily translate to practice-based research, a challenge for researchers and practitioners alike. In response, EDRA developed CORE to serve as a measuring stick to assess the value of research that goes beyond rigor alone. EDRA CORE’s unique evaluation framework identifies practice-based environmental design research that is not only rigorous, but also offers measurable value, meets industry challenges, and advances design thinking; recognizes the importance of research in practice; provides a compass to guide designers, researchers, organizations, and manufacturers; and builds on EDRA’s tradition of inquiry, reflection, and collaboration and its commitment to innovation. The following practice-based design research projects met the CORE criteria and were selected for recognition, based on the review of a cross-disciplinary panel of reviewers consisting of academic researchers, practice-based researchers, designers, and industry thought leaders. The CORE recipients will be recognized during EDRA48Madison May 31-June 3, 2017 in Madison, Wisconsin. Giyoung Park, PhD., AIA,Senior Design Research and Associate, HKS, Inc. The Environmental Design Research Association is an international, interdisciplinary organization founded in 1969 by architects and psychologists concerned with integrating people's needs in shaping the built environment. EDRA exists to advance and disseminate environmental design research, thereby improving understanding of the inter-relationships of people with their built and natural surroundings toward creation and curation of environments responsive to human needs. For more information, visit www.edra.org. © 2019 | EDRA − The Environmental Design Research Association | All rights reserved.